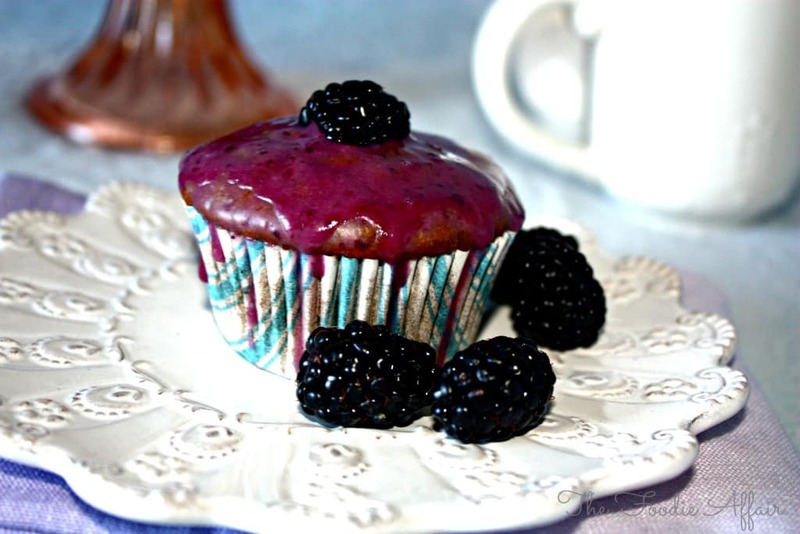 Blackberry Yogurt Muffins with a light glaze are moist and flavorful. 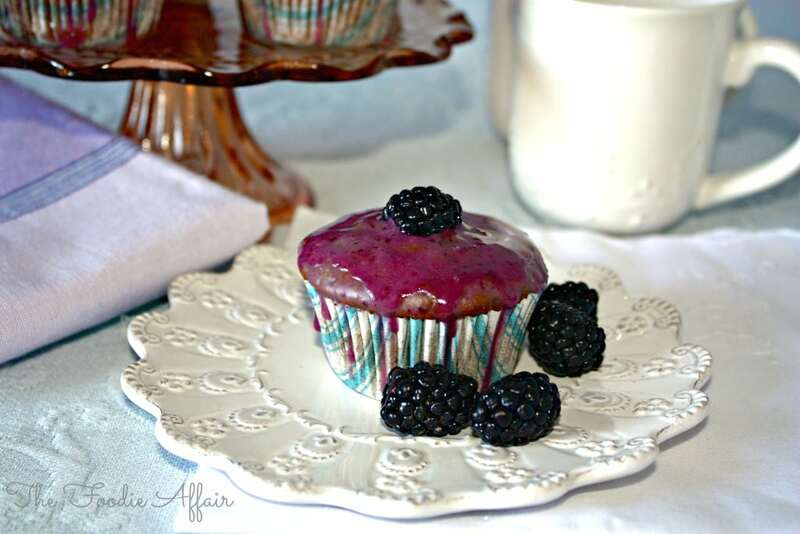 Instead, I made these Blackberry Yogurt Muffins and they were delicious! I healthified (that really should be a legitimate word!) the muffins just a little by adding part whole wheat, yogurt for the moisture content and boost in protein, plus fresh berries, one of the best natural antioxidants ever! They’re not too sweet, but they still taste like a treat, especially with the glaze added to them. I made these for my co-workers as a welcome home treat. See, our office has been going under building renovations, so some of the staff was relocated to a different site. A skeleton crew was left behind, which included me, so for 3 or so months now my taste testers were on the other side of town! I think my co-workers are happy to be back sampling my treats as well because the muffins sure didn’t last long! Learn how to keep berries fresh longer by trying these tips from The Kitchen Chopper! 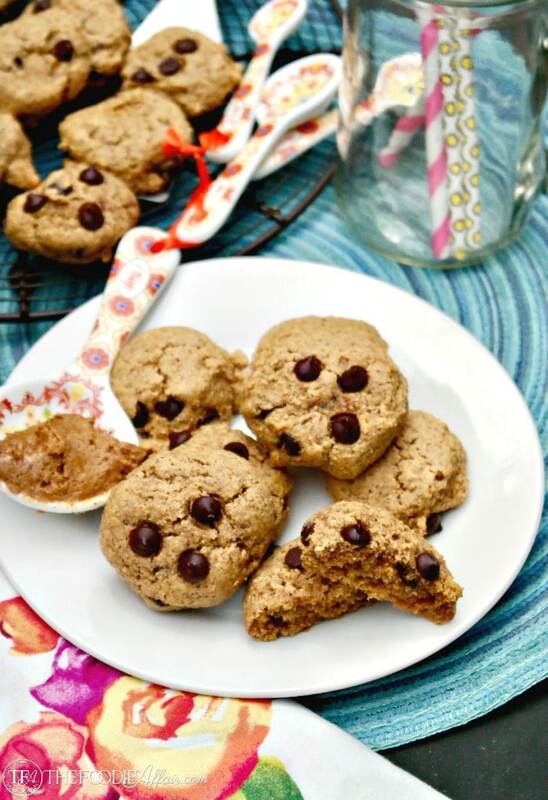 This recipe was shared at Life Current’s Easter Saturday Dishes Party! Preheat oven to 350 degrees and line two muffin pans with paper muffin cups. Set aside. Whisk together the flours, granulated sugar, baking powder, baking soda cinnamon and salt in a large bowl. In a separate medium bowl, whisk together eggs, yogurt, milk, butter and vanilla. Form a well in the dry mixture ingredients and add the wet ingredients. Mix until moistened (do not over mix). 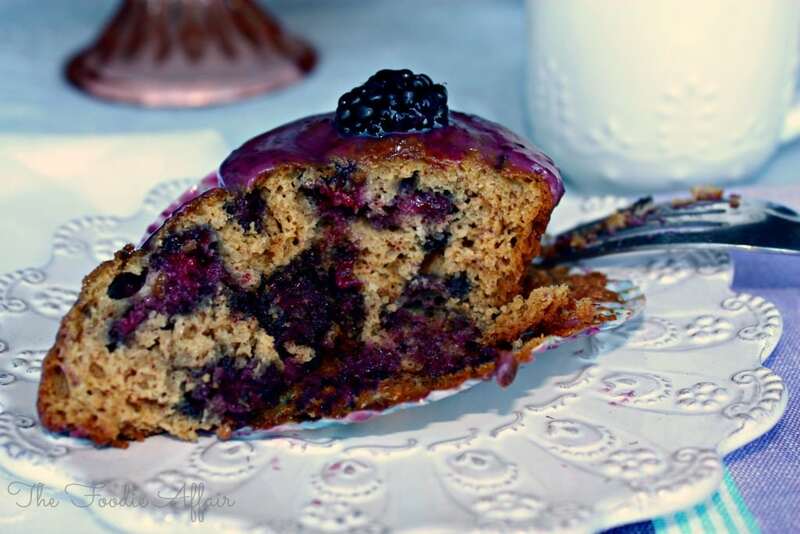 In a small bowl, toss the blackberries with 1-2 teaspoons of flour, lightly dusting the fruit. Fold into the batter. Place muffin batter into prepared muffin cups and bake until toothpick comes out clean (17-20 minutes). Remove from oven and let cool sightly before removing from the muffin pan. Continue to cool on rack. Puree 1 cup of blackberries in a blender or food processor for about 1 minute. Remove and strain with a small holed sieve, leaving behind the seeds. Reserve two tablespoons of the puree for the glaze. Whisk together powdered sugar, Greek Yogurt, vanilla and blackberry puree. G’day! Looks good Sandra and wish I could try one right now! Hi Joanne! I ate your share 😉 ha! I love the glaze on top! It compliments this muffin perfectly! this looks absolutely yumm.. Feel like trying it right now. Blackberries are my favorite and this is a beautiful dish. Love the use of greek yogurt. thanks, Janette! I’m best friends with Greek yogurt. Love it! They sure were bursting with blackberries! I had to show how yummy they looked cooked up! Yes, love the natural dark purple in muffins and margaritas! Do those ever look tasty! Sandra, these look so delicious. I wish I had some fresh berries to make these now. Pinning/sharing. Thanks, Joanne! Fresh berries are so fantastic! Can’t get enough of them! I love yogurt in baking and the color of the glaze is amazing! These blueberry muffins look so moist and delicious. I love when I locate great finds at the market that inspire us to cook or bake. These muffins look ridiculously delicious, I want to try it! These look so yummy! Thanks for sharing them at the Saturday Dishes Linky. They would be perfect for Easter! Thanks for hosting a great party! I’m going to be making mini muffins for Easter! 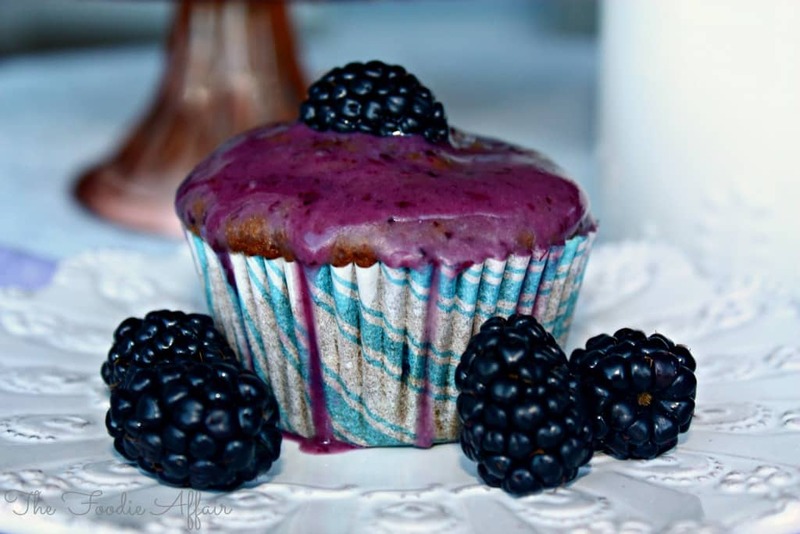 I love blackberries and I love muffins, so sounds like a win-win to me!! Thanks for sharing at our Easter party at Saturday Dishes. Pinning.